N1809E came off the production line as 498th DC-8 and was delivered to Braniff in October 1969 in a orange color scheme. Later chocolate brown was used. 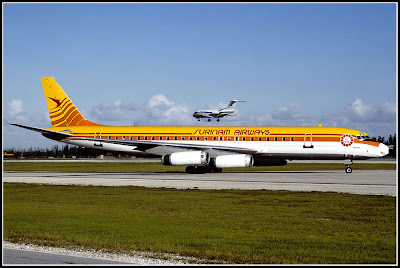 In December 1983 she was leased by Arrow Air and two weeks later sub-leased to Surinam Airways and painted into one of the most beautiful schemes ever worn on a DC-8, at least in my opinion. Finally bought in 1986 by Surinam she was christened "Fajalobi", name of a bright red flower which translates into "passionate love". After a short lease to Tropical Airways she returned to Suriname and again plied the route to/from Amsterdam. Renamed to "Anthony Nesty" , a Surinamese swimmer and the 2nd black athlete to win an olympic medal (1988 at the summer olympics at Seoul). On June 7th, 1989 flight PY764 was approaching Paramaribo-Zanderij airport inbound from Amsterdam. The Captain attempted to capture the unreliable ILS-glide slope signal , even the flight was cleared for an VOR/DME approach by Zanderij tower. The DC-8 flew into the ground 3km before the runway and went up in flames - only 11 passengers survived of the 187 people on board. I am taking pictures and collect slides since 1977. During this time I received lots of slides through exchange, buying or auctions. All the images you will find here are part of my collection (i.e. I have the original slide in my possession). All the pictures are copyright "Propfreak Collection". In case you discover a slide you took and you don't like it to be seen on my blog - let me know and we will talk about it..